It’s been about 4 million years since I made anything containing chocolate. This doesn’t mean I haven’t been eating chocolate…I have…I just haven’t made my own sweet treats. Grain free chocolate chip cookie dough truffles. I have to admit, I didn’t think these up on my own. My inspiration came from Jessica at How Sweet it Is. I used the cookie dough recipe for my Healthy Chocolate Chip cookies, sans baking soda and with a little added cinnamon. I’ve discovered an even MORE delicious way to make these… Check out the printable recipe below! Rolled the dough into balls, and refrigerated for 30 minutes to let them solidify. 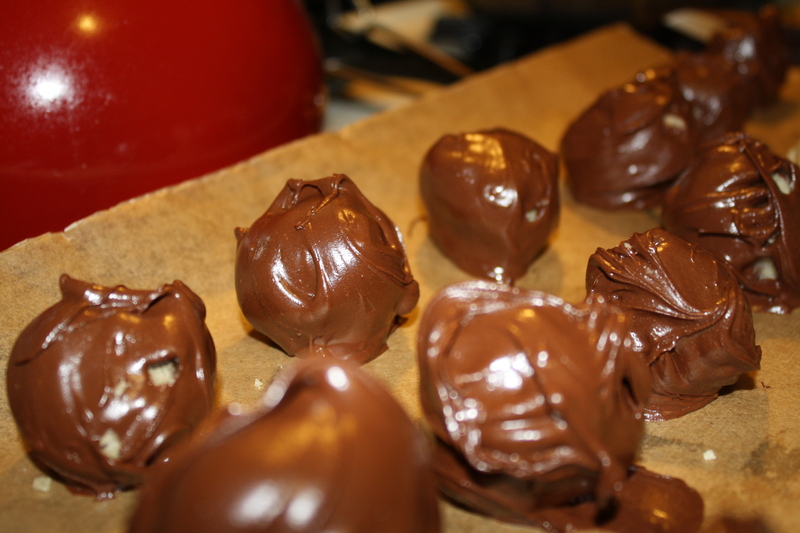 Then, I melted some semi-sweet chocolate, and dipped. These were seriously good. If you’re looking for a sweet treat, you should probably make these, like, now. I love, love, love chocolate! 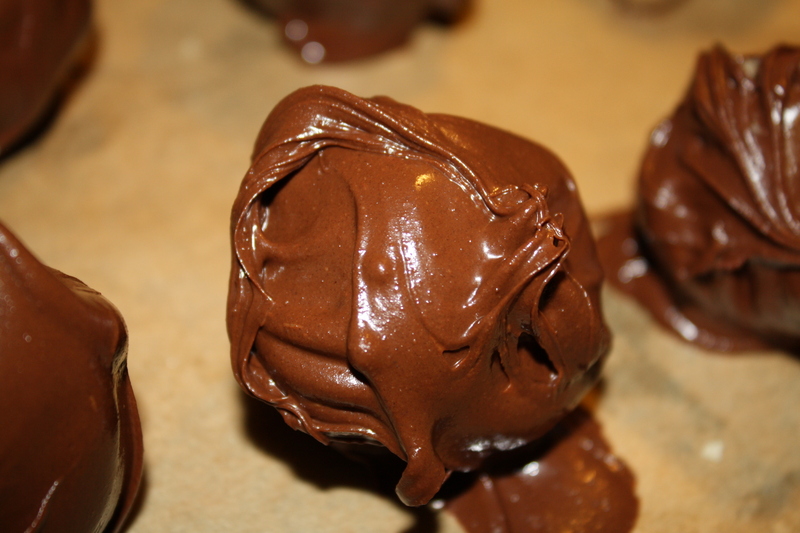 I would only do one thing differently when I make these again–I will dip them in darker chocolate! Allow the butter to soften to room temperature aka mushy and a little bit melty. In a medium-sized bowl, combine the butter, maple syrup or honey, and vanilla. Cream these ingredients together with either a hand mixer or manually with a spoon (I did this manually and it turned out fine). Once the butter mix is smooth, stir in the almond flour one cup at a time. Then, add the coconut flour one tablespoon at a time: the batter should be firm enough for you to form into balls, but not so dry that the balls fall apart. You may have to play around with the amount of coconut flour, so just add it one tablespoon at a time, mix and reevaluate. 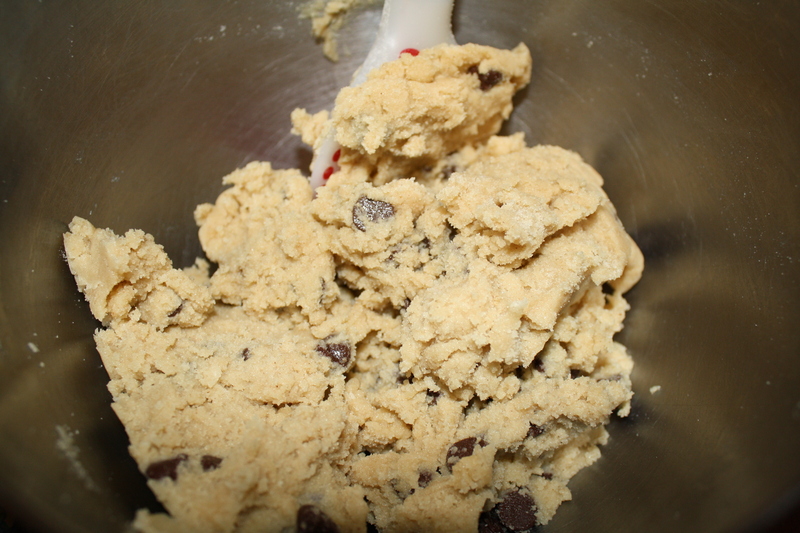 Add the salt and mini chocolate chips and stir. Line a baking sheet with parchment paper. Form the dough into balls about 1 Tbsp big and set them on the tray to chill in the fridge for at least 30 minutes. Dip in chocolate if you like, OR you can just eat them plain...they're pretty good either way. What sweet treats have you enjoyed lately? Hello chocolate! These look divine. 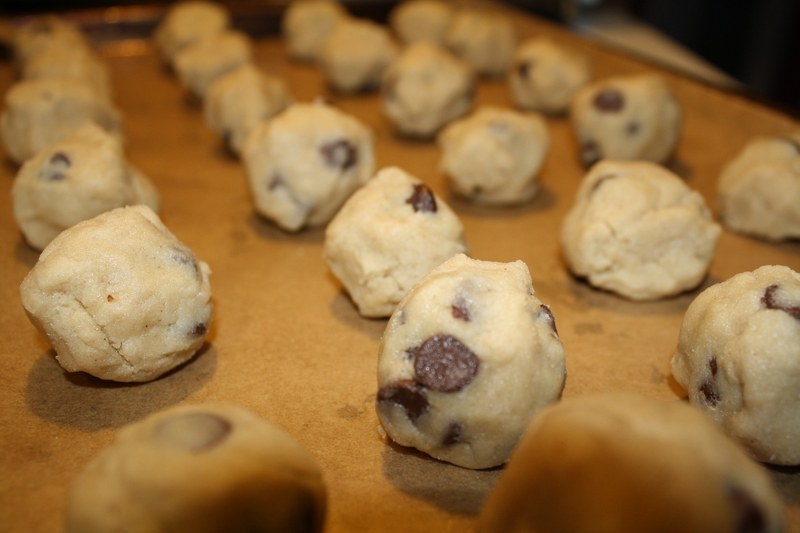 Great minds think alike, I literally just made some cookie dough balls – like, minutes ago! I did not dip them in chocolate yet, but I will later! Thanks, Bianca! Let me know how yours turn out! That seems like a lot of butter. Do you know that fat content? Great recipe, can’t wait to try. One question, do these need to be refrigerated once set? These look DIVINE! I can’t wait to try them! I have one question though…. do you happen to know the calorie count per truffle? I did see the total fat that you posted, but I’m currently living in the crazy world of counting calories. Thanks! Hi Marion– I believe there are about 120 calories in each truffle. Only 5 grams of natural sugars. That may seem a little high, but as a once in a while sweet treat, the calories won’t matter much in the long run. I’ll let you know how they come out – but if it sounds like I did anything wrong – let me know! Thanks!! Hi Lilli! It sounds like you did everything RIGHT! Sometimes they can turn out a little different depending on the almond flour that you use– I used Bob’s Red Mill, which is blanched. When in doubt, just add a little more almond flour– it won’t change the taste or make them too dry like adding regular flour might. How did they turn out? They were DELICIOUS!!! However, and I wanted to change my post, turns out the one thing I had my dear husband do was cut the butter! Seemed he cut too much and he realized after. But yes, I did what you said, added the flour – and they were sooooo good! They were better the next day! Going to make another batch right now as a matter of fact. Thanks so much! And yes, I used Bob’s flour too – I have tried Trader Joes, but I think the Bob’s Red Mill is much better! Sorry to bother you again!!!! I think I figured out my problem… I just made another batch, used less butter – but it is so greasy! So I was thinking – do you cream the butter and whip the batter???? Which would make sense. I melted the butter 🙁 I just couldn’t figure it out!! Do you think that might be it? Hi Lilli! I’m so glad that they turned out for you! I’m not a super technical baker by any means, I melted the butter and then whipped it with the vanilla and honey. BUT it would probably work better if you just softened the butter and creamed it with the honey and vanilla…I’ll put that note in there now so that others don’t have this problem! Thanks for the feedback! Thanks again! So funny because I saw your review of those brownies and thought they were perfect! My friend has the book and sent me the recipe but I’ve already ordered the book. And I will check out the carrot cake too! Maybe I’ll make. Going home to make a test batch of brownies now! I do use the Kerry gold butter on the cookie dough. They were so greasy that I had to squeeze them with paper towels! HOWEVER they taste delicious!! I’ll figure the butter thing out. It HAS to be in my technique. Love this blog!!!!! Thanks again!! Hmm…mine were greasy too because the almond flour doesn’t really soak up the butter very well…MAYBE try adding a sprinkle of coconut flour next time? That will definitely absorb the greasy. I haven’t made these in a while, so I think I’ll make them again this weekend or next week and see how it goes…maybe there are so more modifications I can make…thanks again for the feedback! You’re going to LOVE the brownies! Can you use regular gluten free flour or does it need to be almond meal? The almond meal adds some texture and substance, but you could try some gluten free flour and maybe add some unsweetened coconut. Let me know what you decide to try! Made these today and switched the c. chips for coconut flakes. Most definitely drool worthy. Fantastic recipe! Thanks! Can’t wait to try these! Great recipe!! These look amazing!! 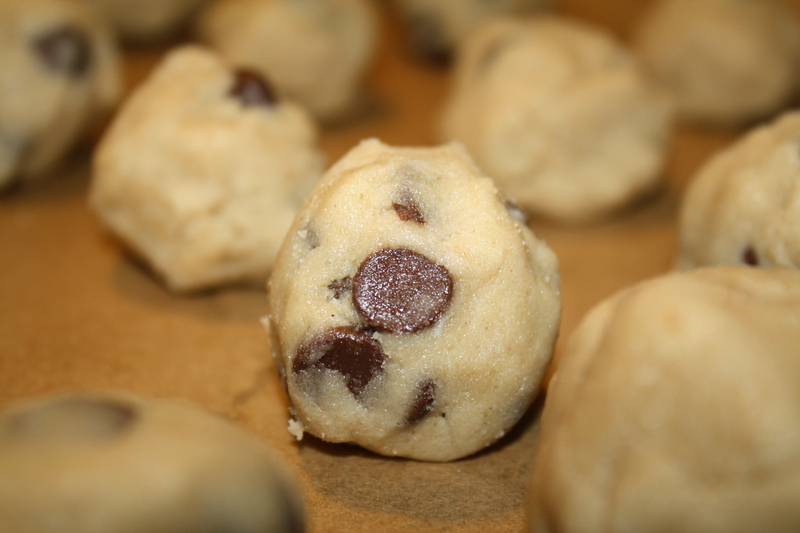 Im cutting out refined sugars and im gonna try this chocolate chip recipe with it!! I’ve made these before and my 19 year old son LOVES them!! Can you post any additional nutrient content: fiber, protein, I see above the fat is 8g and carbs 5. Thanks. These look delicious! We’ll have to try these soon! Any chance of using only coconut flour and this recipe still turning out alright? Hmm…I think you need the almond flour to “harden up” the truffles. I think that using that much coconut flour would make them a little dry. You could use some gluten-free flour, or another nut flour in the place of the almond flour…OR maybe increase the amount of butter/coconut oil and use coconut flour….I’m not sure how they’re turn out though…let me know how it goes! Just wanted to say thank you!! I make these without the dipping in chocolate step, half the maple syrup and about a 1/4 cup chopped dark chocolate chips. Divine! I pop it in little mason jars and put them in the fridge. Wonderful go-to for a healthy, delicious treat. Really love this. Thank you!